Your access to and use of our website(s) located at, or linked to, the URLs www.iheartveg.com or www.iheartveg.com/store and the services, information, and content that may be offered on such site (the “Website”), including, but limited to, the ability to receive newsletters and promotional emails, and product orders, are subject to the following rules (“Terms and Conditions of Use”) and all applicable statutes, orders, rules, and other laws. Anyone younger than 18 years of age is forbidden from becoming a member on the Website or purchasing from the Website. All information posted on the Website is subject to change without notice. Additionally, these Terms and Conditions of Use may be changed, altered, or modified at any time without prior notice. I Heart Veg, LLC (“Company,” “we,” or “us”) will make such changes by posting them here. It is your responsibility to periodically visit the “Terms and Conditions of Use” link at the bottom of our home page to review the most current version of the Terms and Conditions. You can determine when these Terms and Conditions of Use were last revised by referring to the “Last Updated” information provided at the top of these Terms and Conditions of Use. Your continued access and use of the Website after such changes demonstrates your acceptance of any and all changes. Our current Terms and Conditions of Use supersede all prior written or oral understandings or agreements. You may, at your discretion, and at any time, print a copy of the Terms and Conditions using the print feature in your browser. I Heart Veg is not responsible for photographic or typographical errors on this Website. We reserve the right, at any time, temporarily or permanently, in whole, or in part, to modify or discontinue the Website, with or without notice, and/or offer opportunities to some or all users of the Website. You agree that neither we nor any parent, subsidiary, or affiliate, nor any of our or their respective sponsors, vendors, licensors, distributors, or licensees shall be liable to you or to any third party for any modifications, suspension or discontinuance of the Website, in whole or in part, or of any service, content, feature or product offered through the Website. The I Heart Veg Logo, I Heart Veg avatar, iheartveg.com, and I Heart Veg Blog, among other trademarks, service marks, domain names, and slogans used on this site, are protected by I Heart Veg under United States, Canada, and/or international intellectual property laws. Unless otherwise specified, all materials appearing on our Website are the sole property of I Heart Veg. All audio and video clips are the sole property of I Heart Veg, and/or the original creator of the materials, or our respective content providers, including, but limited to, our Website visitors and affiliates. The content on our Website is the property of I Heart Veg and/or its suppliers and is protected by U.S. and international copyright and other intellectual property laws. All trade names, trademarks, service marks, and logos are property of their respective owners. I Heart Veg disclaims any proprietary interest in intellectual property other than its own. The use of our trade names, trademarks, service marks, or logos without our express written consent is strictly prohibited. You may view, download, print and retain a copy of the pages on our Website only for your personal use. Unless prior written permission is obtained, you may not reproduce, copy, manipulate, license or distribute any intellectual property used on our Website. All rights not expressly granted herein are reserved. By visiting this Site, you represent and warrant that (a) you are at least 18 years old; (b) you are a resident of the United States; (c) you have the authority to provide us with all such information; (d) all such information may be used by us for the purposes intended; (e) all such information shall be true, accurate, and complete; (f) you will be responsible for maintaining and updating such information as needed, such that the information remains true, accurate, and complete; (g) you shall maintain the confidentiality of your account and password; (h) you accept all responsibility for any activities that occur under your account and password; and (i) all materials submitted by you through the Site or for the inclusion on the Site will not plagiarize, violate or infringe upon the rights of any third-party including trade secret, copyright, trademark, trade dress, privacy, patent, publicity, or other personal or proprietary rights, not contain inappropriate, offensive, harassing, or other unacceptable material. You agree that we may terminate your access to or use of our Website should any information you provide be false, inaccurate, obsolete, or incomplete. You must be 18 years or older, a resident of the United States, and have either a valid credit card or bank checking account, with full authority to use it, to submit an order through our Site. You agree not to use our Site or any other content contained in it for any illegal or inappropriate activities. You may not interfere with the security of the Website. You may not impersonate this Website. You may not take any action to interfere with the Website or any other user’s use of the Website, insert any code or product or manipulate the content accessible through the Website in any way that affects any user’s experience. Use of the Website requires compliance with all applicable statutes, orders, regulations, rules and other laws. All users must respect the rights and dignity of others. You may not post, upload, share, transmit, or distribute anything that is threatening, harassing, degrading, hateful, offensive, racist, or that promotes injury or harm to any person or animal. You may not display pornographic material of any kind. You may not solicit passwords or other personally identifying information for commercial or unlawful purposes from other users. You may not use this Website to promote any illegal or criminal activities. You may not use this Website to solicit any unauthorized promotional materials, junk mail, or spam. You may not impersonate another person or business entity. You may not remove any trademark or copyright information from the Website. You may not frame or mirror any part of the Website. You may not use, reprint, or link to any materials from the Website for commercial gain. We may suspend, limit, or terminate all or a portion of your access to the Website, and/or your rights to use any of the content we provide, at any time, without notice and without cause and limitation should we believe that you have violated the Terms and Conditions of Use. You are personally responsible for any and all orders that you place or charges that you incur prior to your termination. Official notice of your termination may come by email or postal mail. Upon such termination, your right to use the Website will immediately cease. Additionally, we reserve the right to report any illegal or unlawful activities to law enforcement. You agree that we shall not be liable to you or any third party for any suspension, limitation, or termination of your access to the Website. You are responsible for the creation and safekeeping of your passwords that you use to access the services of the Site. You are responsible for any activities and actions created under your password. We are not liable for any failure on your part to comply with the above requirements. Keep your password safe and do not share it with others. If this Website is accessed from a public computer, you must follow all relevant instructions to sufficiently disconnect and log off of this Website to prevent any unauthorized access to your I Heart Veg account. Please note, I Heart Veg will not ask you for your password in an unsolicited communication. 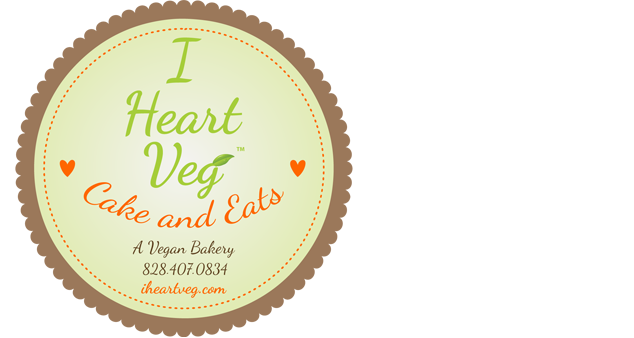 Should you receive any email or other communication requesting this information, email us at veggie@iheartveg.com, or call us (828.357.8061). When registering for an account on the Website, you represent that you (a) are 18 years of age or older; (b) are not creating an account or using an email or user name that is currently in use by another user, can be misconstrued as impersonating another person, or violates the intellectual property of other rights of any person; (c) agree and adhere to the representation of use declared for Website access; (d) agree that you are responsible for all activities occurring under your account and username; (e) are responsible for keeping your account password safe and secure; (f) will notify immediately of any known breach to your account or failure in password security; (g) will properly exit or log off your account at the end of each session; (g) warrant you are using the Website only for permitted purposes. Each computer monitor displays colors differently and the colors of items and products may not be correctly displayed. We cannot guarantee that your monitor’s display of any color will be accurate or match the color of the product. Prices and availability of the products and other items listed on the Website may change at any time, without notice. Reference to any product or service on the Website does not constitute an offer to sell or supply that product or service and does not mean that the product or service is available or that the name and description of any product from our wholesale distributors will be identical to that listed on our Website. Homemade products, assembled packages, kits, and baskets are assembled individually and may vary slightly. We reserve the right to substitute a product of equal value and nature if the original product becomes unavailable. The prices are displayed on the Website are quoted in U.S. Dollars and are valid and effective only in the United States. We do not ship outside the United States. Inventory information is generally available on the Website for domestic United States orders only. This information does not provide a guarantee that the product listed is available and available for immediate shipment. A product can be listed as in stock when you place your order and sold out by the time your order is processed. Should there be such an incident, you will be notified by email that your order will not be fulfilled and your credit card will be credited. Your receipt of an electronic or other form of order confirmation does not signify our acceptance of your order, nor does it constitute confirmation of our offer to sell. We reserve the right at any time after receipt of your order to accept or decline your order for any reason. We reserve the right at any time after receipt of your order, without prior notice to you, to supply less than the quantity you ordered of any time. We can limit the quantity of items purchased per person, per household, or per order. We will notify you should such limits be enforced and applied. We may require additional verifications or information before accepting any order. We will contact you if any or all of your order is cancelled or if additional information is required to accept your order. If your order is cancelled after your credit card has been charged, we will issue you a credit/refund to your credit card in the amount of the charge. All orders placed on the Website are subject to product availability and will be shipped according to our shipping terms. Should you experience any shipping problems, contact us. You may pay for your order via the methods offered to you through Paypal, Serve, and Square. Your order will be charged or debited at the time the orders are placed. Paypal, Serve, and Square maintain their own methods as to how and when your payment is processed. We neither store not collect your credit/debit/bank information. The third parties listed above handle our secure credit card and electronic check transaction processing. Please refer to their respective sites for more information. Should a product be listed with an incorrect price or incorrect information due to a typographical error or error in pricing, availability, or information, received from our suppliers, affiliates, distributors, and manufacturers, we shall have the right to refuse or cancel any orders placed for products listed with the incorrect information and/or price. We shall reserve the right to refuse or cancel any order that has been placed for such product or service at the incorrect price, even if the order has been confirmed and/or your credit card has been charged. In the event that an item is mispriced, we may, at our discretion, either contact you for instructions or cancel your order and notify you of such cancellation. If your credit card has already been charged for the purchase and your order is cancelled, we shall promptly issue a credit to your credit card account in the amount of the incorrect price. We neither accept orders for nor ship to international addresses. Products and items delivered to incorrect addresses supplied by the sender. Unsuccessful deliveries arising from the recipient not being present at the time of delivery at the address supplied by the sender. Decreased product quality or issues caused by improper handling by the recipient, including an incorrect delivery address supplied by the sender, or reroute requested by the sender. Please read our return, replacement and refund policy prior to purchasing products from our Website. All sales made through this Website are subject to our Return Policy. Please note, no food items or food related items are returnable. Damage due to shipping mishandling is the only form of recovery one can receive for food and food related items and all damage must be documented by photographs. We guarantee that you will be completely satisfied with any purchases ordered on the IHeartVeg.com/Store website. If you are not completely satisfied, upon the return of the non-food product in question, we will refund the purchase price or replace and deliver an equivalent product as soon as reasonably possible. You have seven (7) days after delivery to make a claim on said guarantee. You are responsible for all shipping and/or restocking charges incurred to return the item to us. You are responsible for reading the official rules that accompany each special offer, coupon, discount, contest, and sweepstakes that we offer. If using a coupon code, it must be entered during checking in the designated “Coupon Code” field in order to redeem the respective offer. Coupons are limited to one per transaction. Coupons may not be combined with other coupons or promotional offers. Coupons may not be redeemed for cash, credit, or refund. I Heart Veg reserves the right to restrict the use of coupons on any and certain products, including shipping and weight fees. We automatically charge and withhold the applicable sales tax for orders to be delivered to addresses within North Carolina. Each customer shall be solely responsible for all sales taxes, or other taxes on orders shipped to any other state. We appreciate and welcome any feedback, reviews, and comments you submit to us by e-mail or via our online forums, and/or contact forms. Feedback and product reviews, including but limited to stories, videos, photos, text, articles, ideas, suggestions, links, and any associated personal identifiers and likenesses are considered non-confidential and become the property of I Heart Veg and are considered “public information.” By submitting any “public information” to I Heart Veg, you hereby grant I Heart Veg an irrevocable, perpetual, and unrestricted royalty free license to use, adapt, copy, create derivative works of, publicly display, modify, reproduce, transmit, and distribute said materials for any purpose whatsoever, in any media, to the extent permitted by law and shall be free for us to use on an unrestricted basis without any compensation to you. We will not sell the rights to said “public information” to any third parties. I Heart Veg is not and will not be held responsible or liable for any content provided by our users/subscribers/members or other third party users of the Website. Users can be held liable for any illegal or prohibited user content they provide to the Website. Users who submit “public information” and materials to the site agree that (a) you are the copyright holder of the submitted materials, including but not limited to, feedback, product reviews, stories, videos, photos, text, data, articles, ideas, and suggestions; (b) the submissions do not violate or infringe upon any intellectual property rights, patent, trademark, trade secret, or copyright; (c) the submission is not considered confidential; (d) you waive all limitations of copyright rights, trademark rights, rights of publicity and integrity, moral rights, and any attribution/authorship rights; (e) you have the right to grant the licenses granted in this section; (f) the submissions are neither illegal nor contain inappropriate activities or images; (g) release I Heart Veg from any and all liability related to the distribution, publication, and dissemination of said materials , including internet publication. We reserve the right to remove and alter any user submitted materials from the Website at any time without notice. We are not liable for any content provided by our users or third party providers. Inclusion of content by any third party contributors, including those identified as users/subscribers/members, do not necessarily represent the views or opinions of I Heart Veg. Third parties, whether identified as users/subscribers/members, affiliates, or other third party contributors, may contribute content to the Website. Any opinions, statements, offers, submissions and other information provided by said third parties are solely those of the respective authors and not of the Company. Any sites that we may link to that are operated by third parties are not under our control and we can therefore provide no guarantee that the content of those sites is accurate, legal, safe, and inoffensive. Our linking to third party sites does not warrant that these sites are free of viruses or provide a venue to safely shop or participate. You should be aware of any site’s privacy practices before providing them with your personal and confidential information. Our linking to these sites does not constitute an endorsement of the third party site. You agree and understand that you may not make any claims against us for damages or losses resulting from your use of our Website to obtain search results and/or link to a third party site. If a link on our Website has caused you a problem, please contact us to notify us of the issue. The laws of the State of North Carolina shall govern these Terms and Conditions of Use, without regards to its principles of conflicts of law. You hereby expressly consent to exclusive jurisdiction and venues in the courts located in the State of North Carolina, and waive any objection to such courts, including without limitation on the basis of jurisdiction, venue or inconvenience of the forum. By using our Website you agree to indemnify and hold I Heart Veg, The I Heart Veg Store, its subsidiaries, affiliates, officers, agents, employees and other partners and employees harmless from any loss, liability, claim, or demand, including reasonable attorneys’ fees, made by any third party due to or arising out of your use of this Website, including providing a link to another site or any User content. If any part of these Terms and Conditions of Use shall be held or declared to be invalid or unenforceable for any reason by any court of competent jurisdiction, such provision shall be ineffective but shall not affect any other part of these Terms and Conditions of Use. All users of the Website must comply with the U.S. Copyright and related laws. Owners of copyrighted works who believe their rights under U.S. Copyright law have been infringed should report alleged infringements to us under the DMCA Safe Harbor Provisions Section 512(c) required form and guidelines. We will work to remove or disable access to the material claimed to be infringing and will follow the procedures specified in the DMCA to resolve the claim between the notifying party and the alleged infringer who provided the submission at issue. Address your notice to: I Heart Veg, Terms and Conditions, P.O. Box 764, Black Mountain, North Carolina, 28711. OUR SOLE AND EXCLUSIVE MAXIMUM LIABILITY AND YOUR SOLE AND EXCLUSIVE REMEDY WILL NOT BE MORE THAN TO REFUND THE PURCHASE PRICE OR TO REPLACE AND DELIVER EQUIVALENT PRODUCT ITEMS, AS APPROPRIATE, AS SOON AS RESONABLY POSSIBLE. WE RESERVE THE RIGHT TO REQUEST THAT THE ITEM BE RETURNED BACK TO US WITHOUT THE BURDEN OF SHPPING COSTS PLACED UPON US. THE APPLICABLE GUARANTEE MUST BE BROUGHT WITHIN SEVEN (7) DAYS AFTER DELIVERY OR WE SHALL NOT BE LIABLE AND YOU WILL HAVE WAIVED ANY AND ALL RELATED CLAIMS REGARDING SUCH PRODUCT ITEMS. WE ENDEAVOR TO PROVIDE YOU WITH THE MOST CURRENT AND ACCURATE INFORMATION AVAILABLE. WE, HOWEVER, CANNOT GUARANTEE ACCURACY. THE WEBSITE, INCLUDING ALL SERVICES, CONTENT, AND SUBMISSSIONS MADE AVAILABLE OR ACCESSED THROUGH THE WEBSITE, IS PROVIDED “AS IS” AND “AS AVAILABLE.” YOU EXPRESSLY AGREE THAT USE OF THIS WEBSITE IS AT YOUR SOLE RISK. WE DO NOT GUARANTEE THAT THE WEBSITE AND ANY SERVICES OFFERED ON THE WEBSITE WILL BE SECURE, ERROR-FREE OR UNINTERRUPTED, OR THAT THE WEBSITE OR THE SERVER THAT MAKES IT AVAILABLE IS FREE OF VIRUSES OR OTHER HARMFUL COMPONENTS. WE DO NOT WARRANT THAT ANY USE OF OUR WEBSITE WILL PROVIDE SPECIFIC RESULTS. NEITHER I HEART VEG NOR ITS THIRD PARTIES HAVE ANY RESPONSIBILITY FOR YOUR ACTION OR INACTION IN CONNECTION WITH THIS SITE OR FOR ANY DAMAGE TO YOUR COMPUTER OR DATA OR ANY OTHER DAMAGE YOU MAY INCUR IN CONNECTION WITH YOUR USE OF THIS WEBSITE. EXCEPT FOR THE GUARANTEE PROVIDED ABOVE IN THIS SECTION, WE EXPRESSLY DISCLAIM ALL REPRESENTATIONS, GUARANTEES, WARRANTIES, EXPRESS OR IMPLIED, OF ANY KIND WITH RESPECT TO PRODUCTS SOLD ON OUR WEBSITE, OUR SITE’S USE, INCLUDING BUT LIMITED TO, THE IMPLIED WRRANTIES OF MERCHANTABILITY, FITNESS FOR A PARTICULAR PURPOSE, AND TITLE/NON-INFRINGMENT. NO ORAL OR WRITTEN INFORMATION OR ADVICE GIVEN BY I HEART VEG, OR OUR AUTHORIZED REPRESENTATIVES SHALL CREATE A WARRANTY OR IN ANY WAY INCREASE THE SCOPE OF OUR OBLIGATIONS UNDER THESE TERMS AND CONDITIONS, EXCEPT WHERE THE EXCLUSION OR LIMITATION OF CERTAIN WARRANTIES IS PROHIBITED BY LAW. SOME JURISDICTIONS DO NOT ALLOW THE EXCLUSION OF IMPLIED WARRANTIES, SO THE ABOVE EXCLUSIONS MAY NOT APPLY TO YOU. YOU AGREE THAT, EXCEPT AS EXPLICITY SET FORTH HEREIN, I HEART VEG, ITS DIRECTORS, OFFICERS, EMPLOYEES, REPRESENTATIVES, AFFILIATES, SUCCESSORS, LICENSORS, AND SUPPLIERS SHALL NOT BE LIABLE FOR DIRECT, INDIRECT, INCIDENTAL, SPECIAL, OR CONSEQUENTIAL, DAMAGES RELATED TO PRODUCTS SOLD OR THE OPERATION, CONTENT OR USE OF OUR WEBSITE. YOU AGREE THAT THIS LIMITATION OF LIABILITY IS COMPREHENSIVE AND APPLIES TO ALL DAMAGES OF ANY KIND, INCLUDING WITHOUT LIMITATION TO COMPENSATORY, INCIDENTAL, AND PUNITIVE DAMAGES, DAMAGES FOR LOSS OF PROFITS, REVENUES, DATA AND USE, INCURRED BY YOU OR ANY THIRD PARTY, WHETHER IN AN ACTION IN CONTRACT OR TORT, RELATED TO OUR PRODUCTS OR YOUR ACCESS TO, AND USE OF, OUR WEBSITE OR ANY OTHER HYPER-LINKED THIRD PARTY WEB SITE, EVEN IF WE HAVE BEEN ADVISED OF, OR ARE OR SHOULD BE AWARE OF, THE POSSIBLITY OF SUCH DAMAGES. YOU ACKNOWLEDGE THAT THIS PARAGRAPH SHALL APPLY TO ALL CONTENT, MERCHANDISE, AND SERVICES AVAILABLE THROUGH THIS WEBSITE, EXCEPT WHERE THE EXCLUSION OR LIMITATION OF INCIDENTAL OR CONSEQUENTIAL DAMAGE IS PROHIBITED BY LAW. SOME STATES/JURISDICTIONS DO NOT ALLOW THE EXCLUSION OF CERTAIN WARRANTIES OR LIMITATION OF DAMAGES FOR INCIDENTAL OR CONSEQUENTIAL DAMAGES, SO THE ABOVE LIMITATION MAY NOT APPLY TO YOU.